After searching for a home they could make their own, New York–based fashion stylist Sam Jaradeh and his philanthropist partner settled on a voluminous loft in a historic SoHo building. The 6,000-square-foot apartment, a sun-drenched space with soaring 16-foot ceilings, was a perfect tabula rasa for the design-savvy duo. After signing the lease, the couple quickly began exploring how technology could complement their concept for the interiors. 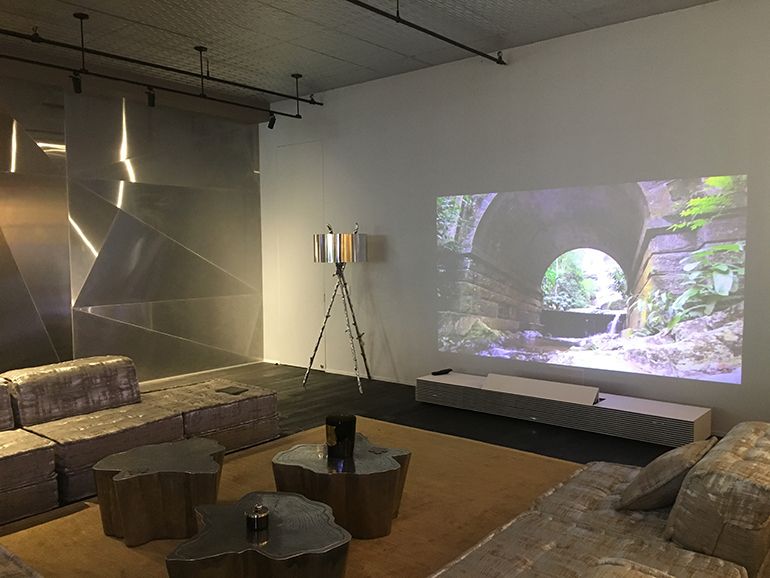 Once they evaluated their options, they decided to purchase Sony’s award-winning 4K Ultra Short Throw Projector for the loft’s rear zone—a secluded seating nook. 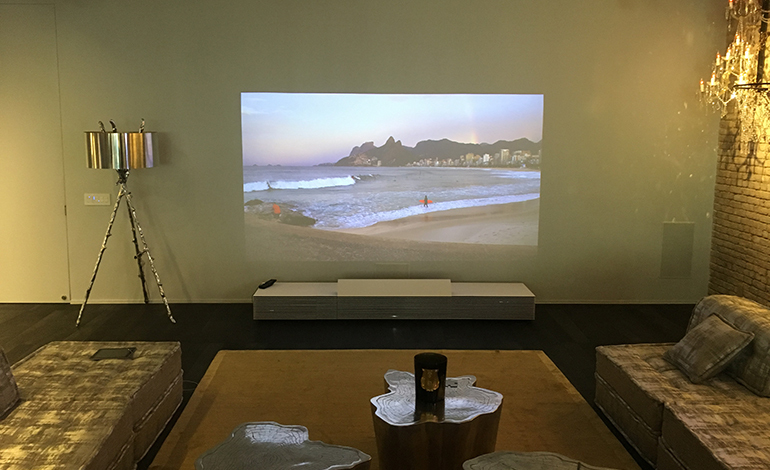 Demarcated by a modular Roche Bobois sofa, the area faces an expansive white wall, an ideal canvas for the projector. 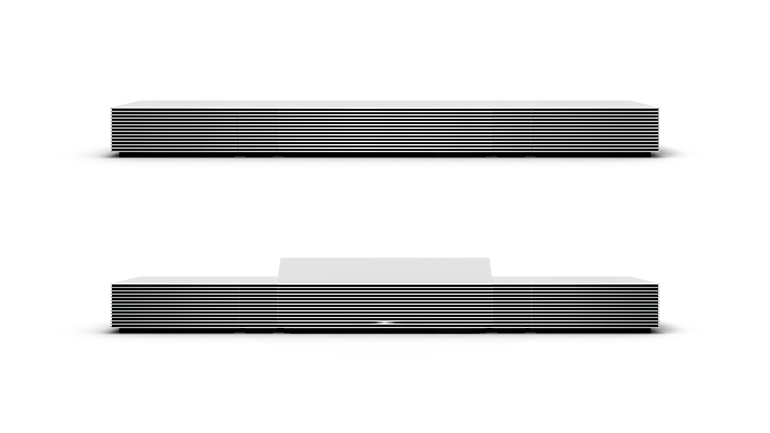 Sony’s 4K Ultra Short Throw Projector, a state-of-the-art electronic that displays images up to 147 inches wide (with four times the clarity of Full HD), brings refined minimalism to the apartment. Jaradeh weighs in on his design decision and how the projector has transformed the couple’s home. What influenced your decision to specify Sony’s 4K Ultra Short Throw Projector? We always knew we wanted a projector, but the more we explored what was available, we realized that most options on the market required dimmed lights and installing a screen. That didn’t work with our apartment or lifestyle—we prefer a light-filled space and didn’t want a drawn-out installation process. After learning about Sony’s 4K Ultra Short Throw Projector, we immediately knew it was a match for our needs. What was the installation process like? We worked very closely with our building’s contractor to laser-cut the entire back wall and then coated it in a plaster finish. 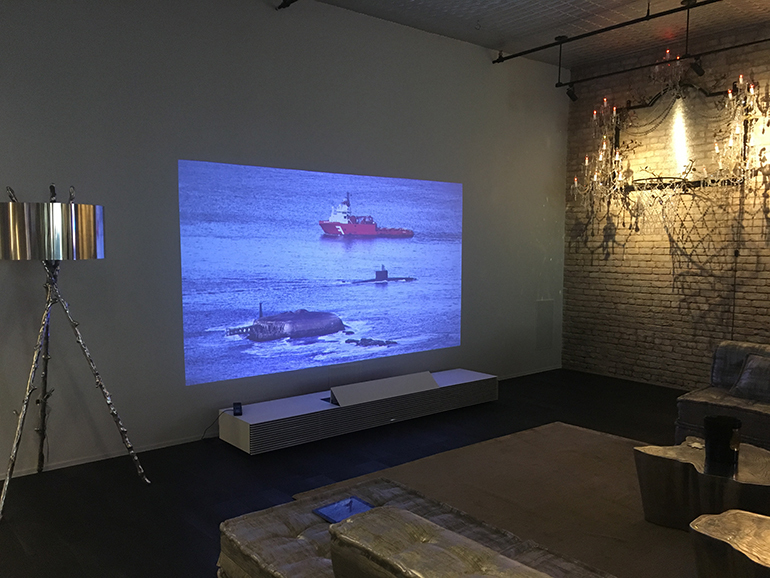 Even though the projection doesn’t occupy the wall’s entire surface, we wanted to make sure we had enough room to reposition the projector as we see fit. Plus, when not in use, we wanted the entire back wall to have a clean, unified appearance. How do you use the projector on a daily basis? We like using the projector to display slideshows—almost like a constant video art piece. We don’t frequently entertain, but when we do, it’s nice to have it running in the background. The back wall is empty otherwise, so why not? We also love using it to play music from our apartment’s integrated speakers and surround-sound system. When not entertaining, I watch YouTube more than anything. 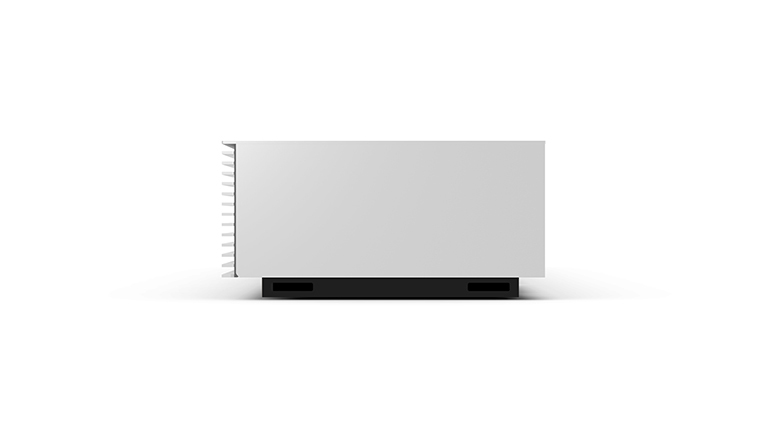 But the projector also connects with Apple TV, Netflix, and broadcast television. The options are nearly endless. What’s been your best experience with the projector? The projector has made me really want to use this space as my own area where I can unwind. In fact, I rarely even use the sofa—I unfold a yoga mat, play with my dog, and watch from the floor! I also installed swivels at the bottom of the side tables so I can move them around. The arrangement of furnishings is constantly in flux. How do you foresee home technology evolving in the near future? I’m not very technologically-savvy—I rarely check my email—but what Sony has accomplished here is impressive. I’m more of a visual thinker, so the projector is a great fit for me.